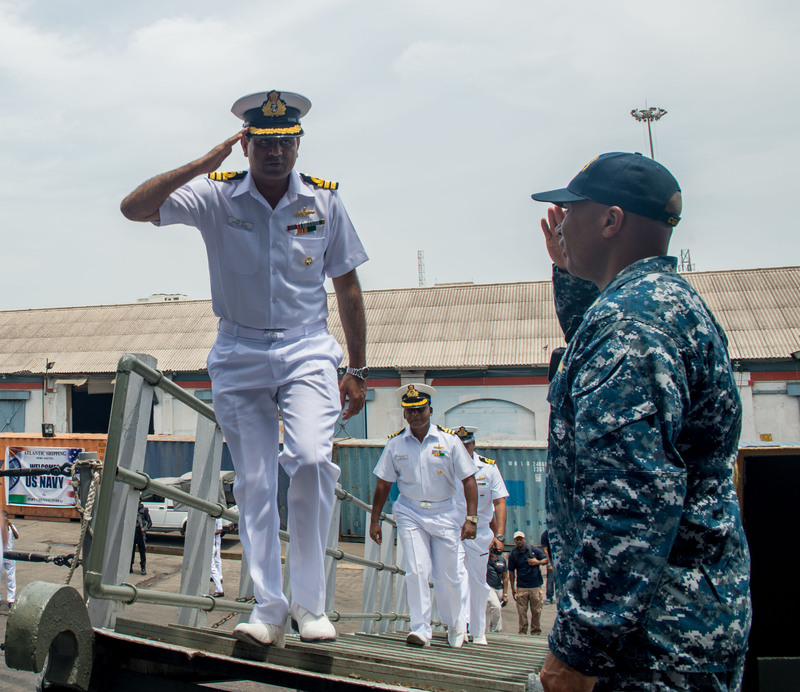 BAY OF BENGAL – Sailors and Marines assigned to the Nimitz Carrier Strike Group, the Indian Navy and the Japan Maritime Self-Defense Force (JMSDF) commenced the Malabar in-port portions in Chennai, India July 9. The maritime exercise Malabar, which was first held in 1992, occurs annually to improve interoperability between U.S., Indian, and Japanese maritime forces. The exercise enhances maritime relationships and demonstrates credible naval power in the Indo-Asia-Pacific region. The tri-lateral, two-phase exercise is held in Chennai, India and in the waters of the Bay of Bengal. The exercise emphasizes high-end warfighting skills, maritime superiority and power projection. Crews will practice surface and antisubmarine warfare maneuvers, perform medical exchanges, hold explosive ordnance disposal training, and conduct visit, board, search and seizure operations. It also provides the opportunity for the participating nations to build upon their common values and shared seafaring tradition while fostering security and stability in the region through common national goals. Malabar 2017 is the latest in a continuing series of exercises that has grown in scope and complexity over the years to address the variety of shared threats to maritime security in the Indo-Asia Pacific where the U.S. Navy has patrolled for more than 70 years promoting regional peace and security. Nimitz is currently on deployment in the U.S. 7th Fleet area of operations. The Nimitz Carrier Strike Group consists of the aircraft carrier USS Nimitz (CVN 68), USS Princeton (CG 59), Carrier Air Wing (CVW) 11, Carrier Strike Group (CSG) 11 staff and Destroyer Squadron (DESRON) 9. The deployed units from DESRON 9 include the Arleigh Burke-class guided-missile destroyers USS Howard (DDG 83), USS Shoup (DDG 86), USS Pinckney (DDG 91) and USS Kidd (DDG 100).